Egypt's Tamarod campaign disavowed several of its leading members on Tuesday, including two representatives of the group in the country's constituent assembly, Al-Ahram's Arabic news website reported. The youth group is famous for spearheading the 30 June mass protests that led to the ouster of Islamist president Mohamed Morsi on 3 July. A member of Tamarod's central Bureau, Islam Hamam, read the statement during a press conference held by several members of the campaign's central bureau and provinces' coordinators. Tamarod said Mahmoud Badr and Mohamed Abdel Aziz, the campaign's two representatives in the 50-member constituent assembly, as well as Hassan Shahine and May Wahba, two of its spokespersons, no longer represented the organisation. It added that, along with three other leaders, they will face an internal investigation for making decisions and adopting political positions in the name of the group without consulting its members. The organisation also called for fresh protests to denounce the country's latest political developments. 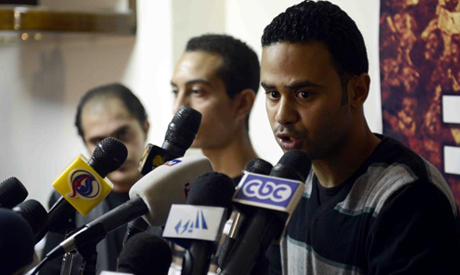 Tamarod's young activists have become players in their own right on the political scene. Some of the group's leaders recently announced Tamarod would run in the upcoming parliamentary elections and repeatedly spoke in favour of the presidential candidacy of Military Chief Abdel-Fattah El-Sisi. Some political currents have criticised Tamarod for tolerating the military's return to politics and breaches to human rights in the name of security. Critics refer to Tamarod’s approval of the forceful dispersal of two main pro-Morsi sit-ins by security forces in mid-August, which left hundreds dead. In the last two months, collective resignations were submitted by leaders and members of the group in the southern provinces of Sohag and Beni-Suef, for the marginalising of offices outside Cairo. This group is only manipulated by Sisi and some coup members to get their objectives. Tamarod is not representative of Eqypt people let the election prove it. Some of their leaders may get many financial advantage by abusing and represent the group. They have no clear objectives, just only follow Sisi's will. Tammarud is effectiely finished. It was used as trojan horse to oust Mursi, but its role is finished. The number-1 political force in Egypt is still the MB. It is true, their popularity suffered a setback, but they still would be able to win any coming free elections. The game is above Tamorod, the government and the MB let alone any other Egyptian entity. Look who has triggered the accelerated plan to destroy the middle east starting with Iraq and it will tell you who is behind all this. The same foreign powers who have been visiting Egypt since Morsi's ouster on a weekly basis are the same ones behind this attempted confusion. At the end however I blame anyone who holds power in Egypt for accepting foreign intervention against the people's interests. Don't ge me wrong the MB minority do not represent the people of Egypt as a majority which they are trying to portray.